Coming off an impressive performance against the Louisville Cardinals, the Kentucky Wildcats collided with the Georgia Bulldogs to end the calendar year but also start the conference schedule for the Wildcats. A tough matchup was expected because Georgia have matched their best start (9-1) of Mark Fox’s tenure in Athens. It was a sloppy first half of the game for the Cats. Nick Richards picked up two quick fouls sending him to the bench with 17:45 left in the first half. Seconds later, P.J. Washington was also called for his second foul and exited the game for the rest of the half. During that time Georgia scored the first 6 points while Kentucky missed its first 6 shots. Kentucky played tough defense after their two big men went to the bench. They held the Bulldogs scoreless for six mins and scored 8 straight points and pulled the Cats even with the Bulldogs at 12. Quade Green, who scored 13 points in the first half, hit a lay-up with 10:25 left that gave the Cats their first lead. Neither team shot the ball very well, Kentucky went cold for 4 mins and shot a terrible 1 for 10. 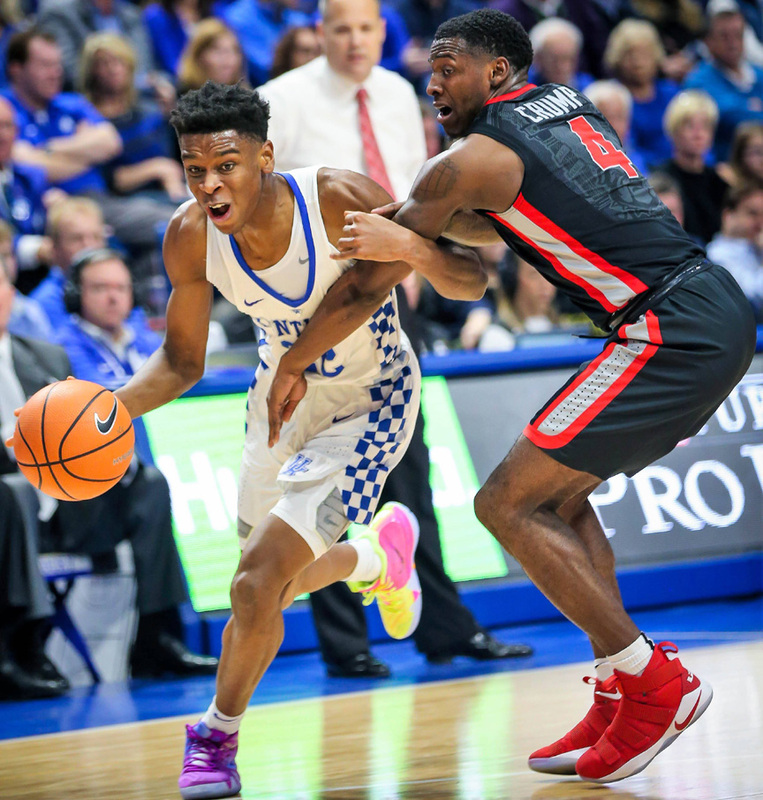 Kentucky was down 5 points with 12 seconds left in the half when Gilgeous–Alexander drove to the basket and got fouled. Mark Fox disagreed with the call and picked up a technical foul. Gilgeous-Alexander hit four straight free-throws to pull the Wildcats within 1 (27-26) to end the half. The Wildcats began the second half the way they began the game, they played poor defense and couldn’t make any shots. The were down by 8 at the first media timeout. Georgia, however, made their first four shots, two of which were three pointers. After a few stops, the Cats pulled back within 5. The Rupp Arena crowd voiced their displeasure when the referees made back-to-back bad calls against the Cats and gave the Bulldogs another eight-point lead. Kentucky’s pressure defense forced Georgia to turn the ball over two straight possessions pulling the Cats within 3. The Rupp crowd were so loud on the Bulldogs next possession they didn’t know that the shot clock was expiring and turned the ball over for a 3rd straight time. A few sequences later Gilgeous-Alexander stole the ball and took to the other end for a dunk and pulled UK within one. With 8 minutes left in the game Hamidou Diallo gave the Wildcats their first lead of the half with a layup. The lead would see-saw back and forth for the next few minutes, but with Kentucky down two with 4:39 left in the game Gilgeous-Alexander hit a huge 3-pointer to give the Cats a one-point lead. It took an Wenyen Gabriel three pointer with 1:08 left in the game to finally seal the game for the Cats. The 61 to 66 victory for Kentucky was vastly different then the previous victory against the Cardinals. One thing that remained the same in both games was Shai Gilgeous-Alexanders great performances. This game specifically showed his ability to take over on both ends of the court when needed. He led the game in scoring with 21 points. On the defensive end he had 3 steals and 2 blocks most of which came at crucial times in the game. It will be interesting to see how he plays the rest of the season. Kentucky will play at LSU on Wed. Jan 3rd at 8:30 on the SEC Network.